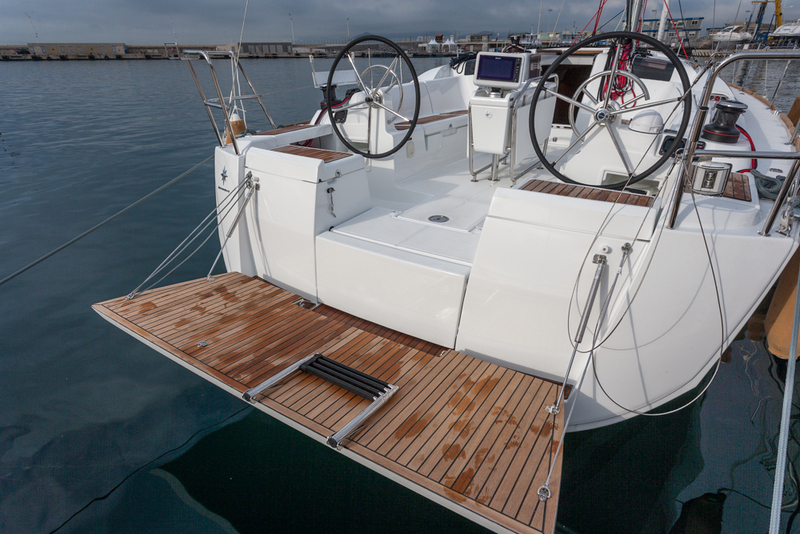 Diego Yriarte goes aboard the new Jeanneau Sun Odyssey 419, a quick cruiser designed to please experienced, demanding sailors. 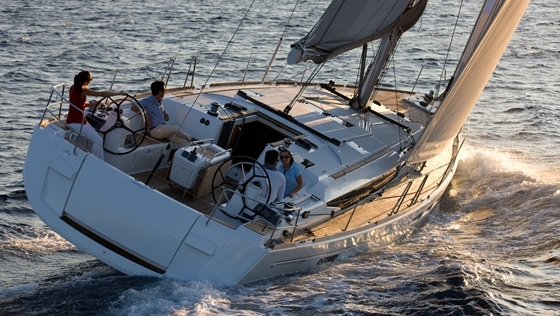 The new Jeanneau Sun Odyssey 419 is good-sized cruising boat that can be sailed by a small crew. 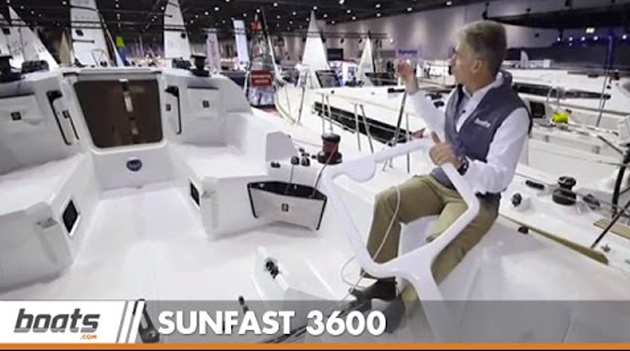 It incorporates all the innovations and key features of the current Sun Odyssey line, and although not a performance boat, it has been designed to be fast and easy to handle. 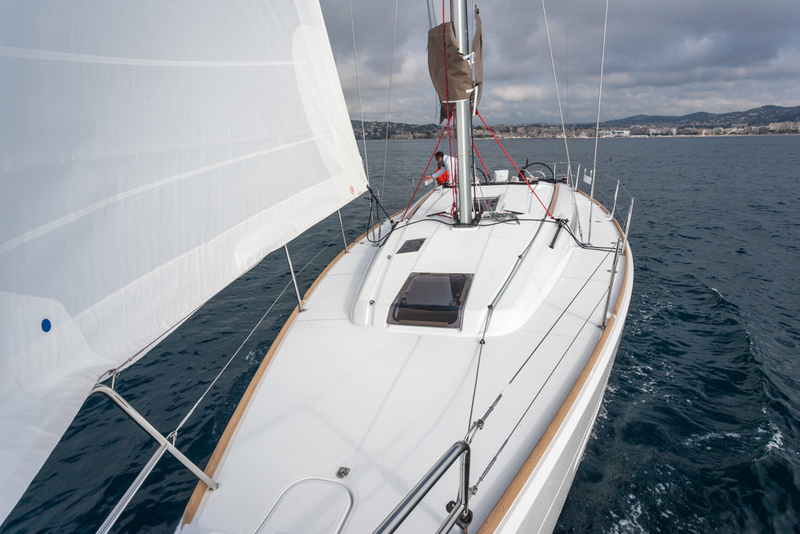 Quick and comfortable, the new Jeanneau Sun Odyssey 419 sails while being tested near Cannes, France. Photo by Diego Yriarte. Successful brands give customers what they want. 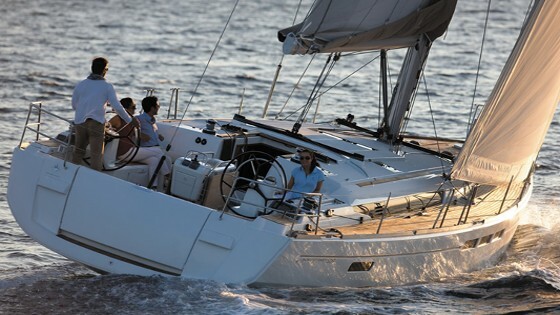 One of the keys to Jeanneau’s success has been its ability to listen and interpret the wishes of the market, which is quite an achievement when your customers come from most every country in the world. 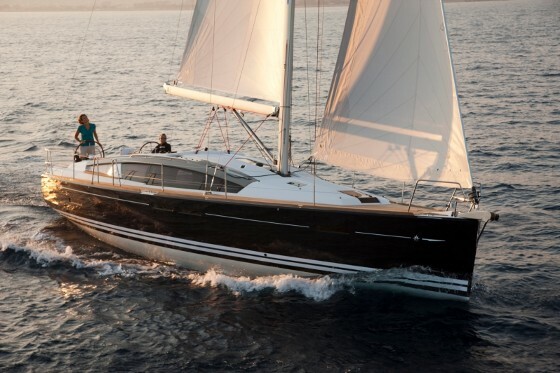 The brand’s appeal is such that it has been able to avoid most of the difficulties generated by the credit crunch and the ensuing recession, extending its reach even further to new markets and new customers and launching new boats year after year. The length of the Sun Odyssey 419, just shy of 42 feet, may be bigger than is ideal for first-time boat owners. It is better suited for those with some experience and a clear idea of where they want to go and how they want to get there. Although it is definitely a fast boat, with a modern hull form that will allow for good performance, its layout has been planned for relaxed and easy cruising. The drop-down swim platform is a highlight of the Sun Odyssey 419. Photo by Diego Yriarte. The most remarkable new feature of the 419 is the drop-down swim platform, which not only makes getting in the water a breeze, but also creates a new space to enjoy under anchor, a privilege usually reserved to much bigger boats. Access to the interior has also been improved with companionway stairs that aren’t as steep as in the past. At Cannes, boats.com tested the three-cabin, two-heads version of the 419. Photo by Diego Yriarte. Buyers can choose between the two or three-cabin layout, with one or two heads. 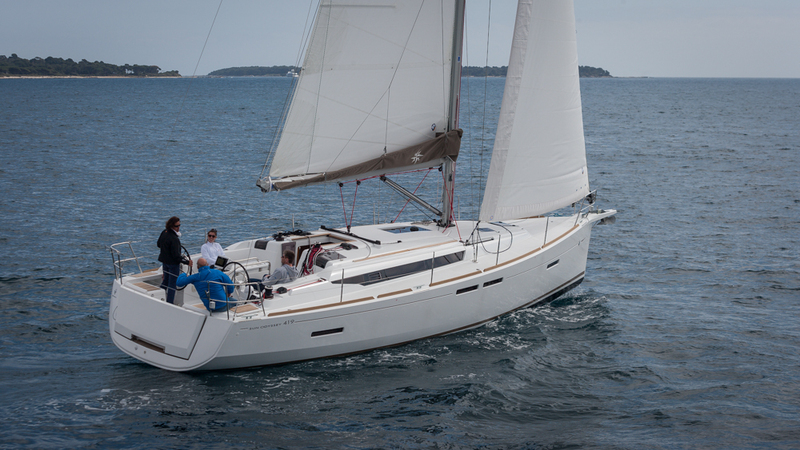 We tested the three-cabin version, which is aimed at the charter market. The two guest cabins are located aft, and across from the galley, to port, is the head and shower compartment where you can also hang your wet gear. 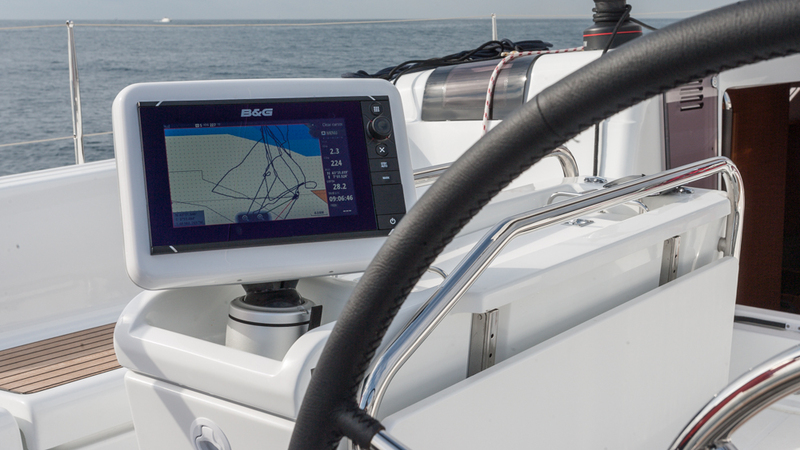 Also to port, between two seats, there’s a small chart table, a feature that on some boats has disappeared as electronic devices and tablets take over from traditional navigation tools. The U-shaped dinette has a reasonably sized table and the option of converting into a double berth. 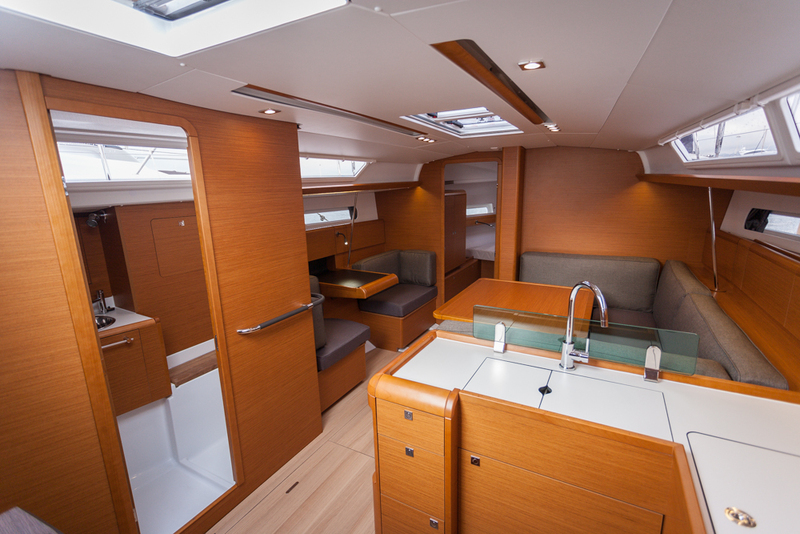 The forward master cabin with en-suite heads and good storage space is especially bright. The deck layout is clean, with almost all sheets and other lines led under the deck. Photo by Diego Yriarte. The deck is designed to be fully enjoyed by the crew. It’s clean, ergonomic and allows you to keep the sheets under control. The cockpit is spacious and the centerline table has a small storage area and two handrails. As mentioned, the most eye-catching feature is the drop-down swim platform, which occupies virtually the full width of the transom, and when it’s deployed allows you to enjoy very close contact with the water. 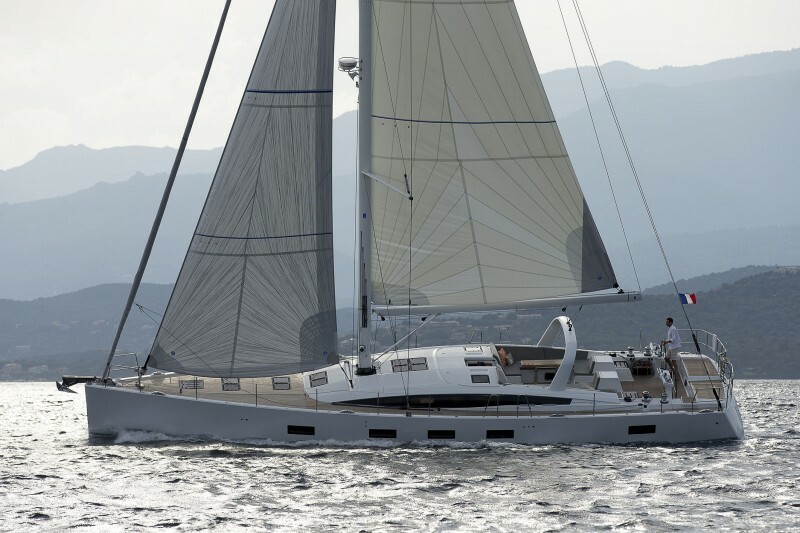 With the sails up, the Sun Odyssey 419 responds well to a modest breeze. Although during our test the wind barely topped eight knots and we were unable to record consistent speed data, the 419 demonstrated that despite being a cruiser, it will move well in lighter winds. The lead car for the 106% genoa is on the cabin top, keeping the walkway clear. Photo by Diego Yriarte. 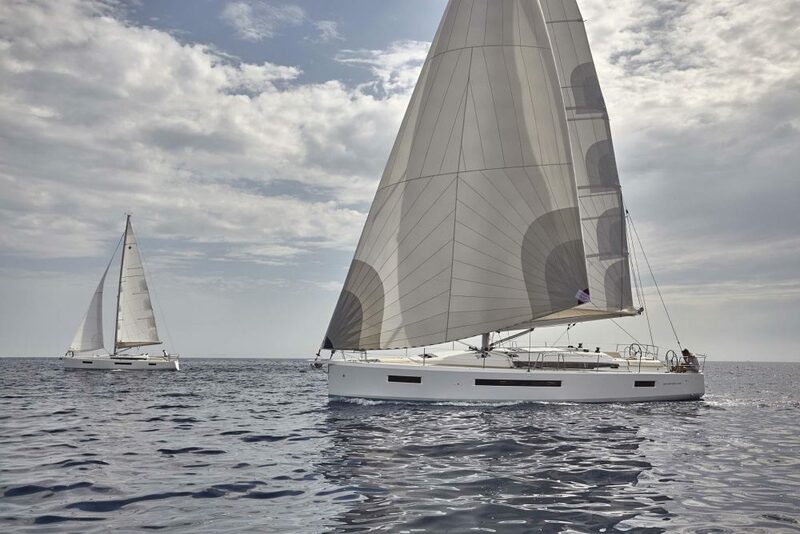 Designed for easy handling, the sail plan comprises a battened mainsail, with a lazy jack system, and a 106-percent genoa. 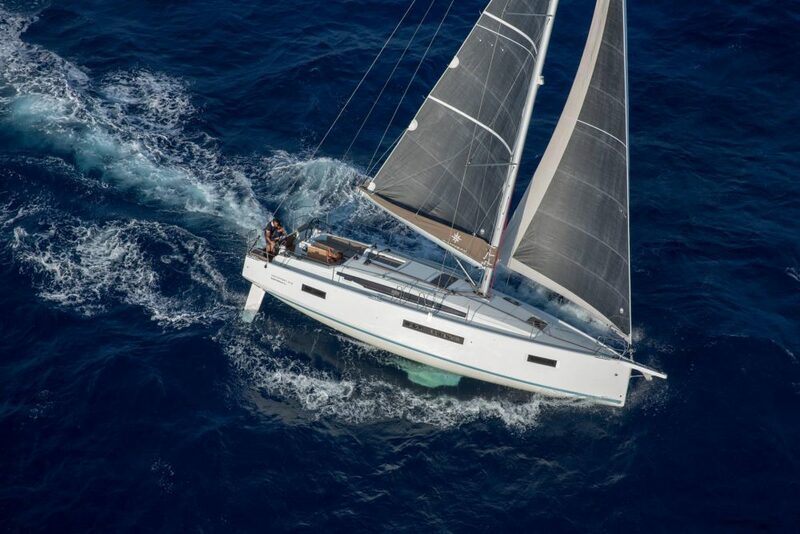 The innovation here is the bowsprit with integrated bow roller, which allows you to fly a large “Code 0” sail and achieve much better performance in light winds. The running rigging is well arranged and most of the lines run under deck, although this solution naturally creates some friction, which may hinder some maneuvers. 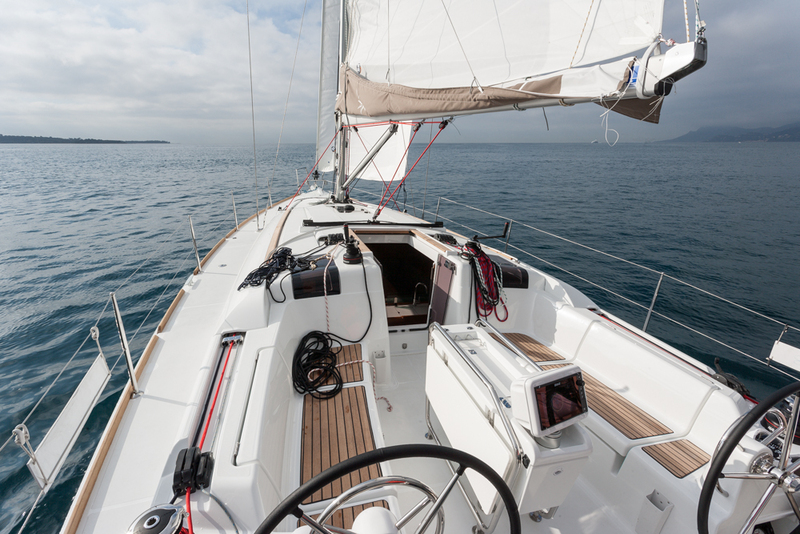 This is the case for the mainsheet traveler, which stays clear of the cockpit by virtue of being located on the cabin top, but for the system to work at the right angle on the stopper and winch, the sheet has to go to the bow and back. The position of the instruments screen can be adjusted so it is visible from many angles. Photo by Diego Yriarte. The main and genoa sheets are led aft to helm winches beside each wheel and there are two stoppers on each side for the convenience of those who want to steer from leeward. Thanks to this system, you can stop off one sheet and use the winch with the other, without having to switch sides. The cockpit is comfortable and the twin wheels allow you to helm from several positions on both sides. Another good development is the single multi-function display that combines all instrumentation in one place and is mounted on the cockpit table. It comes with a mechanism that allows you to adjust its position so that you always get the information you need with the best viewing angle from both helms. The 419 is normally equipped with a 40 HP Yanmar with Sail Drive transmission, which during our test managed a cruising speed of about 5.0 to 6.5 knots and a top speed of 8.2 knots. 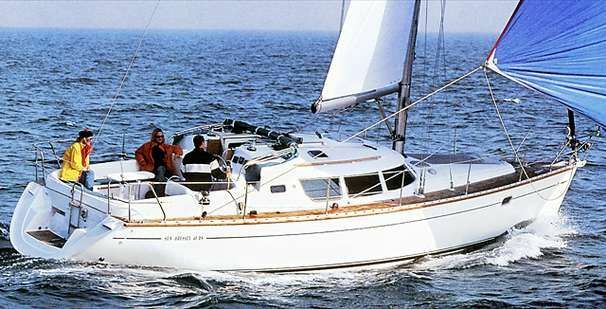 It is true that the hull lines, particularly the hard chine, make you think this is a racing boat, even more so when considering the addition of the bowsprit, but the true calling of the Sun Odyssey 419 is comfortable, fast cruising. Nevertheless, there’s no reason you couldn’t enter your 419 in a local regatta and enjoy a lap around the racecourse.